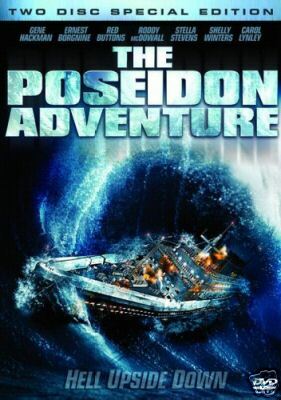 The Poseidon Adventure Special DVD Edition. Disc 1: Audio commentary from director Ronald Neame Audio commentary from cast members Pamela Sue Martin, Stella Stevens & Carol Lynley 'Follow The Escape' interactive featurette Disc 2: 'The Cast Looks Back' featurette 'Falling Up With Ernie' featurette 'The Heart Of Disaster - Stirling Silliphant' featurette 'The Heroes Of The Poseidon' featurette 'The Morning After Sotry' featurette 'RMS Queen Mary' featurette 'AMC Backstory - The Poseidon Adventure' featurette A conversation with director Ronald Neame Storyboard comparisons Original 1972 featurette Trailer Teaser trailer Marketing and publicity stills galleries Review Hell, Upside Down. One of the most gripping escape films of all time follows ten survivors as they struggle to flee from an ocean liner capsized by a tidal wave. Suspenseful terror, combined with the victims' intimate and personal stories, results in compelling and heart-stopping drama. The distinguished talents of 15 Academy Award winners, along with the incredible special effects, make this film a true classic. Actors Gene Hackman ; Ernest Borgnine ; Carol Lynley ; Shelley Winters ; Red Buttons ; Jack Albertson ; Stella Stevens ; Roddy McDowall ; Leslie Nielsen ; Pamela Sue Martin ; Arthur O'Connell ; Eric Shea ; Fred Sadoff ; George Sawaya. Director Ronald Neame Certificate PG Year 1972 Screen Wide screen 2.35:1 Anamorphic Languages English Sub titles English for the hearing impaired Duration 1 hour and 52 minutes (approx) Region Region 2 - Will only play on European Region 2 or multi-region DVD players.